ARMA Milwaukee has served as a valued resource to records and information professionals since 1948! ARMA International Administrative Letter No. 130, dated July 1, 2001, the Milwaukee Chapter of ARMA International was chartered with ARMA headquarters on July 1, 1948. Please join me in welcoming the new Board. Also, I would like to thank this year’s Board for all their hard work and dedication. As the outgoing President, I want to thank you all for your support these past two years. 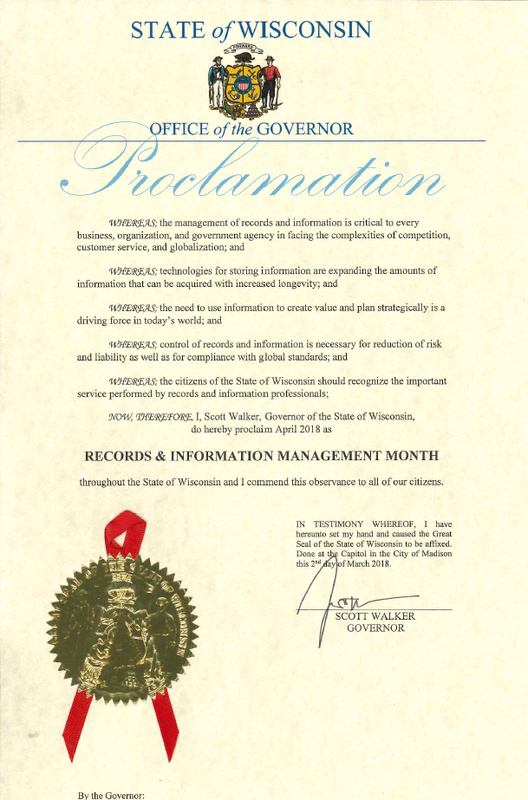 Governor Scott Walker has declared April 2018 to be Records and Information Management Month (RIMM) in Wisconsin. 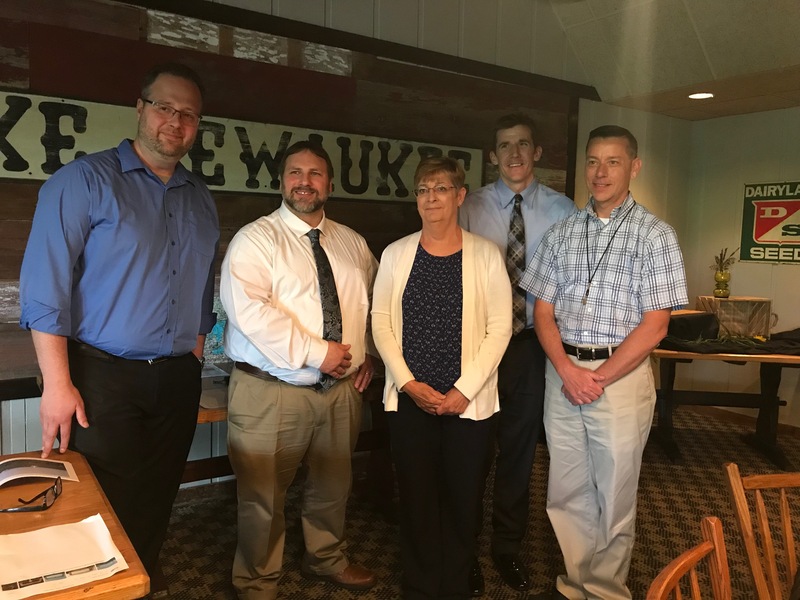 Records and Information Management Month is recognized internationally, but in Wisconsin it was first observed in 1995. The purpose is to emphasize the value and importance of organizing and maintaining records in all media types to ensure the preservation and accessibility of records and information. Your attention is drawn during these 30 days, but it’s important that we always remember and follow through with the ARMA Principles. This field is a collaborative effort and we need everyone’s help to ensure records are properly managed. The points outlined in Governor Walker’s Proclamation for April officially being Records and Information Management Month, should not only serve this month, but every month of the year. Hello ARMA Milwaukee Members ! RIM and Technology – Have you had experience (good or bad) working with a specific technology that has helped (or did not work as planned) your RIM operations? The technology can be anything from a robust records management system to a much simpler piece of software/hardware/program that was intended for a specific function. File Retention – Have you managed to reduce the number of retention schedules in your organization? Let us know, we would like you to share your experiences in how you managed to do it, hurdles you overcame, and how this has helped your organization. SharePoint/Office 365 – Any and all stages of implementation. We do not expect you to cover everything. Nope. If you have worked to implement it in your organization, come talk to us about one stage that stood out among the rest. And even if you are only considering implementing SharePoint or Office 365, come speak to us for a few minutes about the process you have pursued to date, the challenges you have/will face, and ideal outcome you would like to have happen. Legal Aspects – Have experience with discovery holds or dealing with discovery issues (electronic and/or traditional)? Have you ever had to testify in court about RIM policies and procedures for the organization? Do you deal with FOI requests? If so, let us know and we would like to hear from you and your experiences. RIM/IG Program – Have you or are you trying to implement a RIM or IG program? Do you already have a RIM/IG program but now you are trying to sustain it or make it grow. How’s it going? What have you accomplished so far? What has worked? What would you do differently? What lies ahead? Training – How have you gotten people on board with your RIM / IG program? What challenges have you overcome or that you still face? What tips and tricks might you have for the rest of us to use in our organizations? Other – Have you had experience with another facet of RIM that you believe would be valuable for others to know about and that others could learn from? Do you have a RIM-related issue that you are struggling to overcome and would like some feedback? Please let us know. Presentations may vary in length depending on the topic, but nothing longer than 30 minutes so there is plenty of time for discussion.